What Pregnancy Exposures Cause Harm through Preterm Birth? 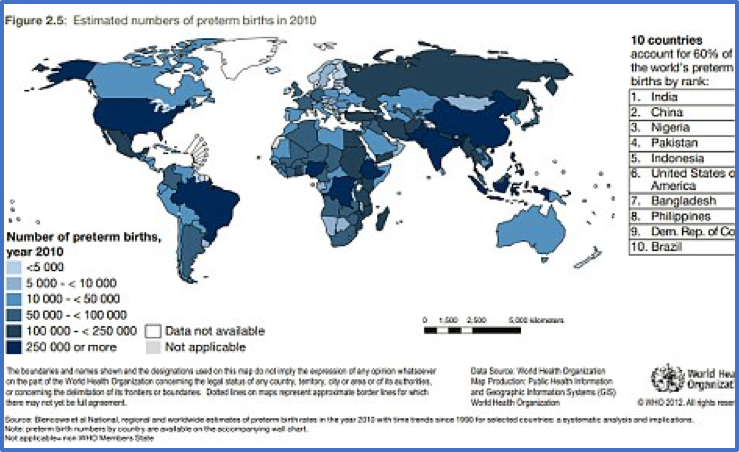 Preterm birth, which by definition occurs before 37 weeks of gestation (term is 38-42 weeks), is a worldwide public health issue and a major cause of infant mortality and morbidity. According to the CDC in 2015, the preterm birth rate in the United States is 10 %, which has probably decreased in part due to the reduction of teen pregnancies. The World Health Organization (WHO) reported that the preterm birth rate ranges from 5% to 18%, with the highest rate in Malawi. The impact of prematurity transcends the neonatal period and affects health during infancy, childhood, and adulthood and requires sustainability of specialized resources. The short and long-term effects of prematurity on the infant are associated with the cause of preterm birth, and we distinguish between indicated preterm birth and spontaneous preterm labor leading to preterm birth. Theories of the initiation of preterm labor include inflammatory pathways that may interplay with environmental and genetic factors. The preterm parturition syndrome suggests that preterm birth is the end result of multiple causes including infection/inflammation, uterine distention, and vascular disorders, but it is unknown if it is an early initiation of the physiologic process of term labor or if it is the end product of a series of abnormal signaling pathways. Although infection is one of the strongest risk factors for preterm birth, inflammation in the absence of infection, defined as a sterile inflammatory response, may play a role and is the proposed pathway of normal term labor. In addition, some theories support a genetic predisposition to preterm labor, supported by genetic differences between individuals (genetic polymorphisms) in the genes that may have a role in preterm birth and differences in the proteins that code for inflammatory and immune responses, such as TNF-α, a pro-inflammatory cytokine, among others. Despite extensive research and the development of these multiple theories, the cause and exact mechanisms of spontaneous preterm labor are still unknown. Nevertheless, multiple risk factors have been consistently reproduced in the literature (Figure 1). History of spontaneous preterm birth, preterm premature rupture of membranes and chorioamnionitis are some of the most significant risk factors associated with spontaneous preterm birth that could be explained by these theories. On the other hand, multifetal pregnancies (twins or higher order multiples), have the highest risk of preterm birth, probably due to the additional component of excessive myometrial stretch. History of preterm birth: For singleton pregnancies, this has been described as the most important risk factor for preterm birth and preventive modalities are mostly directed toward this population. For prevention of recurrence of preterm birth, guidelines include administration of weekly intramuscular 17-hydroxyprogesterone from 16 to 36 weeks and serial cervical length measurements for singleton pregnancies. Preterm premature rupture of membranes: One of the roles of the amnion is to provide a barrier and when it ruptures, ascending bacteria reach the membranes, resulting in chorioamnionitis. The earlier the onset of preterm labor and rupture of the membranes, the higher the likelihood of intrauterine inflammation or infection. Maternal infection: Some non-obstetrical infections may increase the risk for preterm birth due to the activation of inflammatory processes that may cause uterine responses, either by direct contiguous or by hematogenous spread. Asymptomatic bacteriuria, which is the presence of bacteria in the urine without infection, has been shown to increase this risk and therefore a urine culture is included in routine prenatal care. Pregnant patients are at a higher risk of urinary tract infections, including pyelonephritis, which poses even a higher risk of preterm labor, sepsis, and adult respiratory distress syndrome and therefore increases maternal and fetal mortality. Respiratory infections, like pneumonia, could be more severe during pregnancy, and abdominal infections, including appendicitis or cholecystitis, which may require surgical management, can cause preterm birth by causing local spread. Periodontal infection has also been associated with preterm birth and low birth weight. There is tissue breakdown that can activate inflammatory pathways, mostly due to gram negative and anaerobic bacteria. Multiple gestations- More than half of twins deliver prematurely and extreme prematurity (< 28 weeks) occurs more frequently in twins and triplets. Current preventive modalities have shown to be of no benefit to prevent preterm birth in multifetal gestations. Structural causes: In the absence of a pro-inflammatory state, cervical function may be suboptimal due to mechanical forces that could cause cervical insufficiency. The definitions may vary and past gynecologic and obstetric history along with a cervical examination are essential for diagnosis. History of removal of a portion of the cervix (conization) due to cervical dysplasia or malignancy. Surgical excision by conization is typically avoided in young women with high-grade squamous intraepithelial dysplasia. If removal of a lesion is indicated in young women interested in childbearing, the surgical treatment of choice is loop electrosurgical excision procedure (LEEP), which does not increase the risk of cervical insufficiency. Mullerian anomaly - the shape of the cavity is abnormal due to a congenital defect. Diethylstilbestrol (DES) treatment during pregnancy caused a particular kind of Mullerian anomaly in which the uterus has a T shape instead of a triangular shape. These women are now outside the reproductive age range, because DES has not been used for many years. More common abnormalities include bicornuate (two horns), septated, and didelphys (double) uterus. Uterine myomas (fibroids)- common benign tumors that can distort the cavity and affect placental implantation and fetal growth. Myomas are associated with adverse pregnancy outcomes, including preterm labor, usually when the size is greater than 5 cm in largest diameter. Their vascular supply is affected by pregnancy hormones, which may cause significant growth and degeneration of the tumor and can contribute to inflammatory pathways. Despite scientific and technologic development, the conclusions on the effectiveness of some preterm birth prevention strategies are limited. It is hypothesized that once the real process of preterm labor is initiated, there are no effective treatment modalities to stop it. Early diagnosis of preterm labor would prompt early intervention in order to reduce the neonatal risks associated with prematurity. In terms of prevention, bed rest and home contraction monitoring have been proven of no benefit. The current guidelines for patients with a history of preterm birth include serial cervical length measurements and 17-hydroxyprogesterone caproate. Other forms of progesterone may be administered vaginally for cervical shortening seen on vaginal ultrasound. A cervical cerclage can be performed prophylactically on multiparous patients for a history of cervical insufficiency or after cervical shortening is visualized on transvaginal ultrasound or if the patient presents with a visually open cervix in the absence of preterm labor symptoms, such as uterine contractions, pelvic pain, vaginal bleeding, or signs and symptoms of infection. Cerclage is a surgical procedure that may present benefits as well as risks to the mother and the pregnancy and a detailed evaluation is pivotal for adequate patient selection. Once preterm labor is initiated, the current general guidelines include administration of antenatal steroids to decrease neonatal risks associated with prematurity, use of tocolytics, which are medications used to prevent progression of preterm labor (although they are not approved by FDA for this purpose), primarily given to allow administration of steroids, antibiotics to prevent neonatal infection by Group B streptococci or to prolong latency after premature rupture of membranes, and magnesium for fetal neuroprotection in cases of extreme prematurity. The multifactorial nature of this worldwide public health issue has presented and continues to present an obstetric challenge. Although the incidence of spontaneous preterm birth is higher after 34 weeks, it still carries significant neonatal morbidity. The most significant improvement in neonatal survival has been achieved due to advances in neonatal intensive care.